Baby boomers may be familiar with the children's mystery book series featuring amateur girl detective Trixie Belden, based in the the Hudson Valley area of New York. 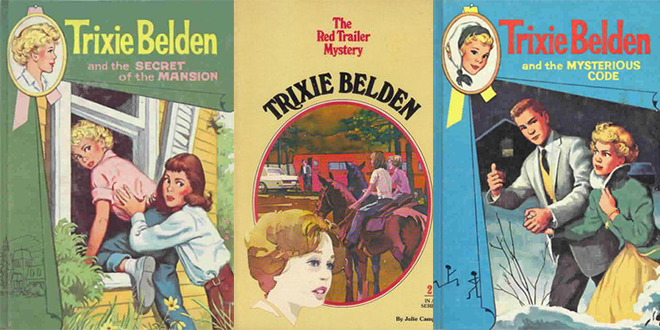 Unlike the Nancy Drew character, Trixie Belden was younger (13 when the books begin, compared to Nancy Drew at age 18), and a less-than perfect tomboy - making her more relatable for pre-teen and young teen readers. Trixie had a complete middle class family - younger brother Bobby, and older brothers Mart and Brian, and both parents - again unlike Nancy Drew, who was wealthier, had only one parent, and was described as generally almost perfect at anything she attempted. Another obvious comparison between Trixie Belden and Nancy Drew is that Trixie had some insecurities about her appearance, while Nancy was always described as always poised and very attractive. The Trixie Belden character also had a group of high-school age friends that eventually formed a club - Bob Whites of the Glen - that included her brothers Mart and Brian Belden, best friend and rich girl Honey Wheeler, romantic interest Jim Frayne, Diana Lynch, and Dan Mangan. The Trixie Belden book series was created and originally written by Julie Campell. Julie Campbell Tatham wrote the first six books in the Trixie Belden series, then author Kathryn Kenny was credited on the subsequent books in the series, beginning in 1961. Julie Campbell Tatham also created and wrote other children's and adult novels, including the nurse Cherry Ames book series, and the Ginny Gordon series. According to Trixie-Belden.com, Kathryn Kenny is a pseudonym used by 8 writers for the Trixie Belden books: Kathleen Krull, Joan Chase Bowden, Laura French, Owenita Harrah Sanderlin, Carl Henry Rathjen, Gladys Baker Bond, Virginia McDonnell, and Nicolete Meredith Stack. The Trixie Belden series of books have been re-released several times, and there are numerous versions of the book covers for different releases of the series. Unlike Nancy Drew, Trixie Belden has never been turned into a television series or movie - a real shame, as she was a very believable young teen character for her time.